To the untrained eye, there is little to distinguish a video poker machine from any other type of slot machine. Amidst the noise, flashing lights, neon colors and bustling activity that typifies any casino environment, a video poker machine will blend in seamlessly with many of the fruit machines, one-armed bandits, and other slot machines that are widely played and enjoyed the world over. But experienced gamblers know that video poker is not like the other slot machines, for a number of reasons. That’s not to say that video poker isn’t part of the slot machine family. The advent of video poker machines has only been made possible by the advancements in technology that have taken traditional slot machines forwards in leaps and bounds in the last few decades. 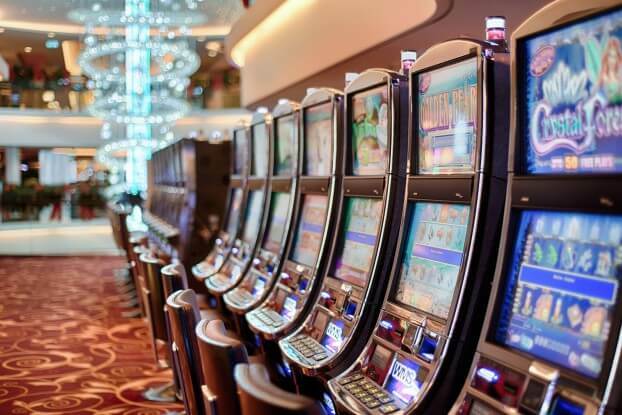 The evolution of slots has been moving forward apace since the end of the 19th century, when early machines introduced gamblers to the advent of popping a coin into a machine in the hope of lining up three symbols in order to win a payout. These mechanical slot machines were pervasive in licensed gambling establishments the world over, right through to the 1960s, when early electronic slot machine technology began to emerge. Developments in electronic engineering paved the way for random number generators, multi-line play, and video display screens that brought additional layers of interactivity and enjoyment for players, whilst allowing slot machine creators to push the boundaries of what they could include when designing the experiences offered by their machines. Dale Electronics is often credited as the creator of the first “true” electronic poker machine, which was called the Poker-Matic and was first made available to members of the public in 1970. The machine quickly gained popularity in the casinos of Las Vegas, where gamblers who had never played poker before were given a new, readily accessible version of the game to try out, and seasoned poker players could enjoy the game they loved without having to assemble a table full of players! In the years that followed, video poker’s popularity grew and electronics companies worked hard to conceive new and improved machines that would deliver gaming experiences that more closely resembled the real thing. In 1979, just nine years after the first poker machine was released, a company called SIRCOMA (now one of the world’s leading video slot machine designers and manufacturers, under the name International Game Technology) announced the launch of a machine called Draw Poker, which developed the video poker phenomenon by incorporating ‘hold’ and ‘draw’ capabilities. This was a key development that pushed video poker towards the modern machines that deliver more immersive, highly realistic poker experiences. Various companies picked up the mantle and pioneered some of the most important developments in video poker technology in the 1990s, when multi-coin, progressive machines introduced the possibility of huge slot machine payouts, and audio-visual elements were introduced to video poker. This paved the way for the technology that allows manufacturers to make machines that combine slots and popular culture, with movie and TV-themed experiences that enhance the user experience proving popular in casinos all over the world. While the roots of video poker and other types of slot machine are undoubtedly shared, the similarities end when it comes to trying to win money on them, as you can see below. One of the biggest mistakes that gamblers make when playing video poker is applying traditional poker strategy to the video version of the game. Having spent years keeping kickers, reading opponents, and learning when to change gears in a poker tournament, poker players take to the machines and assume that the same principles will bring them success, but this is very rarely the case. Understanding the distinctions in how video poker machines work when compared to other slot machines is vital to any player’s chances of winning money at video poker – and those chances are often considerably higher when playing video poker than they are when playing traditional slot machines. This is why you will find video poker experts offering advice on how to win at video poker at various different destinations on the web. In short, a video poker machine can be beaten. This is what makes these machines so uniquely exciting. After all, who ever heard of a fruit machine or one-armed bandit that lost money? However, as the American Casino Guide explains, in order to win at video poker, players need to understand the way that payout tables affect the machines, and be willing to study those payout tables before playing. For example, say that one video poker machine has a payout table that is set up to payout $9 for a full house, while another machine is set up to pay out $8 for a full house. Players of either machine will be dealt each possible poker hand a certain percentage of the time. If you play the machine with a payout table that is set to pay $9 for a full house, and adopt a solid playing strategy, then you stand to win more than someone who chooses the machine with the inferior payout table. However, as well as studying payout tables, it is vital to any player’s chances of success that a strong understanding of video poker strategy is gained before playing. What’s more, video poker machines aren’t all alike and do not all use the same game rules, so this must be taken into account. Despite all this, it is likely that if you understand the rules of poker, and have a strong understanding of the many different implications of a poker hand, you will quickly be able to grasp the nature of video poker. Thanks to the rapid evolution of video poker machines and live online poker games, you’ll be able to enjoy some of the best poker experiences in history without having to leave your house.